Providing essential fatty acid supplementation to help support healthy brain development in babies. Early supplementation of Essential Fatty Acids (EFAs) helps provide a balanced amount of Omega-3 and Omega-6 fatty acids that may not be found in diet alone. 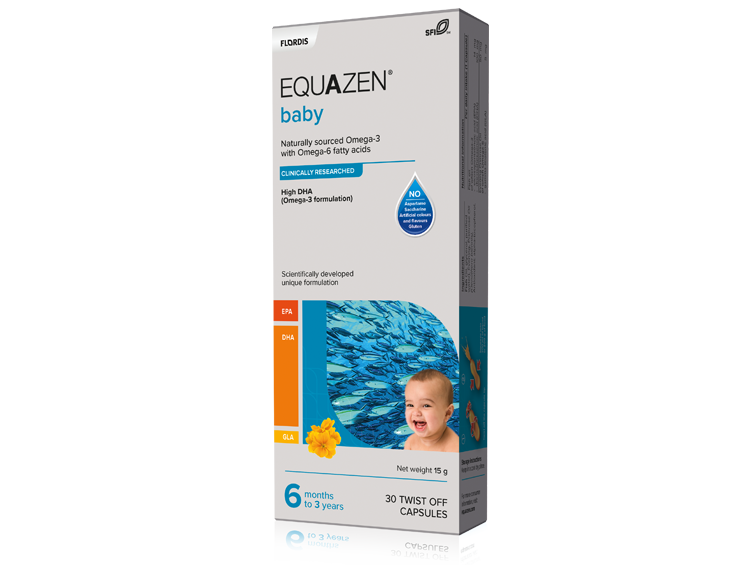 Equazen Baby twist caps are a proactive way of providing EFA supplementation to your baby to help support healthy development of brain and eye function. Food for thought: Did you know that nutrition is the most influential non-genetic factor of brain development? Adding Equazen early will supplement your babies’ essential fatty acids need and support early brain development. Equazen contains only high quality ingredients. Our oil comes from sustainable fish sources such as sardines and anchovies from the Southern Pacific and Morocco Sea. Equazen is well tolerated. Tolerability data from clinical investigations as well as the post-marketing experience confirm the safety profile of Equazen formulations. 7. Antalis CJ, et al. Prost leukot Essent Fatty Acids. 2006;75(4-5):299..